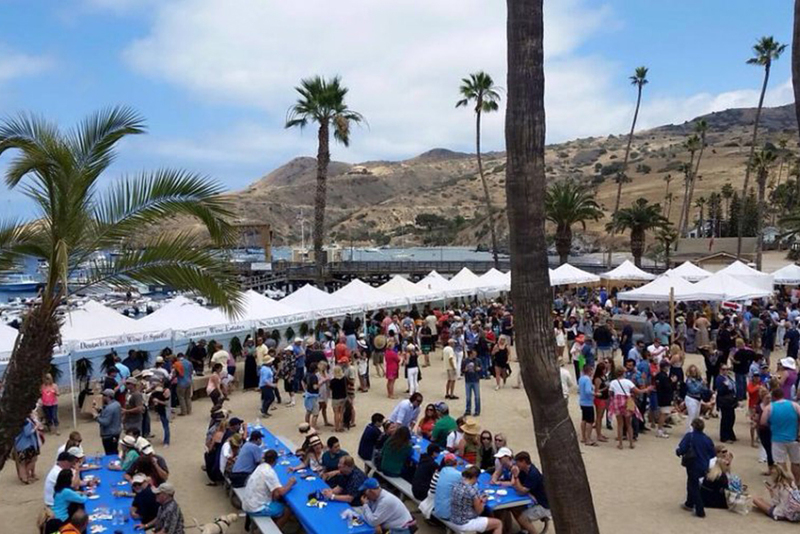 Taste and sip your way through Catalina Island by experiencing the upcoming festival season. From the occasional wine and beer drinker or restaurant goers to an expert oenophile or gastronome, Catalina is sure to have an event just for you. The Island hosts many delicious foodies, beer and wine fests from summer to fall that you won’t want to miss. The small town of Two Harbors on the west end of the Island hosts a variety of different events throughout the year with the two largest being the Summer Wine Festival and the Microbrew Fest. Just like the town itself both are casual and fun. The events offer unlimited tastings, live music, delicious food and silent auctions. Being held right on the beach, you cannot help but have a great time! With the proceeds from this event benefiting the Avalon Rotary Club, you will be treated to a variety of fine wines. There’s nothing better than having your toes in the sand a drink in your hand as you look out at a serene ocean view. With over 30 different breweries pouring selections from around the world, you will be sure to find a brew to accommodate your taste buds. Microbrew Fest is not an event to be missed with proceeds benefiting the Sophie Tarbuck Scholarship Foundation and scholarships for Avalon Schools. Now the only decision you have to make is picking your poison: wine or beer. If you just can’t choose, go with both! Go for the day or make it a long weekend by renting a campsite and enjoy all other great activities Two Harbors has to offer. It is always recommended to get your tickets ahead of time as both events sell out quickly. For the more sophisticated vibe, look no further than the Catalina Island Women’s Forum Wine Festival in Avalon, a personal favorite of mine. This lovely fundraiser features over 70 wineries, delectable hors-d’oeuvres and live music. Net proceeds help support mentoring and scholarship programs. There is nothing like drinking delicious local and imported wines with an ocean view. All of the wine representatives are so friendly and willing to share their knowledge. I have learned so much over the years. If you want more of a party atmosphere, The Original Catalina Wine Mixer is the event for you. Inspired by the famous scene in the movie Step Brothers, the wine mixer is a hilariously good time. This annual weekend-long extravaganza at picturesque Descanso Beach Club features live music, DJs, dancing, fantastic food and cocktails, fun activities and fine wines from West Coast wineries for you to sample and purchase. No Catalina Wine Mixer is complete without an official screening of Step Brothers at historic Avalon Theatre. There are a variety of ticket options to choose from, so you can come to the main Saturday event or enjoy the entire weekend. If you want a little bit more food with your spirits, the Island has two great events you may want to check out: The Taste Around of Avalon and Avalon Restaurant Week. The Taste is a great way to try all the delicious food and drinks that Avalon has to offer. It’s also really economical! To participate you must purchase a $3 voting card from the Catalina Island Chamber Visitor’s Center and each taste will cost anywhere between $1 to $2. As you sample, you will also vote for your favorite in a variety of categories, like Best “Taste of Food” or Best “Taste of Drink.” Make sure to choose your favorite as the restaurants are battling it out for $100 and most importantly bragging rights. Most of the restaurants set up out on the street, so you can hop from restaurant to restaurant enjoying the food and comradery. If you want to sit down to enjoy the culinary delights of the Island, Avalon Restaurant Week is just the ticket. Avalon’s most popular restaurants dish up mouth-watering food at fantastic prices. This foodie celebration provides locals and visitors alike the opportunity to indulge in a variety of specially created prix fixe menus. For more information or how to purchase tickets for these events, please visit the Catalina Express website for the Two Harbors event calendar or Avalon event calendar. Hopefully, you will take the time to participate in one of these wonderful events. Cheers!